App Review: Bear on a Wire by Dreamsocket, Inc.
Bear on a Wire is a very entertaining app featuring a bear riding a bike on telephone wires. The picture of that huge bear on a bike is quite comical and is enough to bring a smile to your face. The object of the game is to complete each course in the time allotted. There is not much time to spare, so you will have to move quickly. Just getting through the levels is not all that exciting, though. 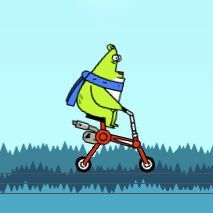 For extra points, you can make the bear perform lots of different tricks on his bike. Be careful not to let him hit the wire, though. If he hits the wire, you lose a life. The controls for the game are relatively simple. There is a paw on the lower right corner of the screen. Touch and hold this button to make the bear go forward. On the left side of the screen there are three buttons; a square, a triangle, and a square. These buttons are used to make the bear do tricks. Each button by itself or in combination with others makes the bear do something. There are so many different possibilities that it took me quite a while to figure out which buttons did what and when they could safely be used without making the bear crash. To keep the bear’s bike on its wheels, you can tip your iPhone or iPod left and right to balance him. You can also use this tipping motion to make the bear perform flips when he is airborne. Just make sure you have him right side up again by the time he lands on the wire again. Bear on a Wire is entertaining and funny. It is a fun, low-stress way to kill some time and have a good laugh. Thanks for trying our little game out and writing up a review. Just a note, we released BOW – Free Ride (our lite version) and it is in the store. We will be submitting a new version of both the lite and pay apps this week. The new pay version will have global hi scores, achievements, challenges, and more. Thanks again for the review . Just a heads up our new 1.1.0 version is now in the store with the global hi scores, achivements, challenges, and more!